Medical device and equipment giant Medtronic Inc. (NYSE: MDT) last week agreed to acquire its Irish competitor Covidien plc (NYSE: COV) for $42.9 billion in cash and stock. Medtronic will pay Covidien shareholders $93.22 per share, which represents a 50% premium over its close on Friday, June 6, 2014. The advantages of the acquisition include market-leading positions in neurovascular technologies for treating Parkinson’s disease and strokes, as well as a much lower tax base once Medtronic relocates its headquarters from Minneapolis, Minnesota to Dublin, Ireland………..Want to read more news? Click here for a free trial to The Health Care M&A Information Source and download the current issue today. It’s been a busy month for health care mergers and acquisitions. The 10 largest deals announced (so far) total a whopping $55.57 billion, and we still have a week to go before the end of the month—and the quarter. There are a few more billion-dollar deals floating out there in the ether, such as Valeant’s (NYSE: VRX) now-hostile $50.8 billion bid for Allergan (NYSE: AGN) and AbbVie’s (NYSE: ABV) spurned offer of $46.5 billion for Shire plc (NYSE: SHP). Although Pfizer (NYSE: PFE) insists it won’t revisit its last bid of $116 billion for AstraZeneca (NYSE: AZN) when the British takeover laws allow, plenty of other companies have been bitten by the M&A bug. This could be a busy summer. Last week, Surgery Center Holdings, Inc., a.k.a. Surgery Partners, a portfolio company of H.I.G. Capital, agreed to pay $792 million for Symbion Holdings Corporation. Symbion is being sold by Crestview Partners LP, which first put the company on the market in November 2013 with a price tag of $800 million. The combined company will operate nearly 100 facilities in 27 states, including six surgical hospitals. Jeffries LLC acted as financial advisor to Surgery Partners and provided approximately $1.4 billion of debt financing for the transaction. McDermott Will & Emery and Ropes and Gray LLP acted as legal advisors to H.I.G. Morgan Stanley & Co. LLC acted as financial advisor and Waller Lansden Dortch & Davis, LLP acted as legal advisor to Symbion. Davis Polk & Wardwell LLP acted as legal advisor to Crestview Partners………Want to read more news? Click here for a free trial to The Health Care M&A Information Source and download the current issue today. San Francisco-based ClearCare, the leading software platform for home care agencies, announced it has raised an $11 million investment led by venture capital firm Bessemer Ventures Partners. Cambia Health Solutions also participated in the round, and was joined by existing investors Voyager Capital, Qualcomm Ventures, Harbor Pacific Capital and City National Bank……..Want to read more news? Click here for a free trial to The Health Care M&A Information Source and download the current issue today. NEW – The Health Care Services Acquisition Report, 20th Edition – Order Today! Deals have been made. The 2014 Health Care Services Acquisition Report contains private deals in this market that are frequently too small to make it into the financial press. Order by June 30th and get a complimentary $150 of transactions in our online health care M&A database. Now that’s a deal! 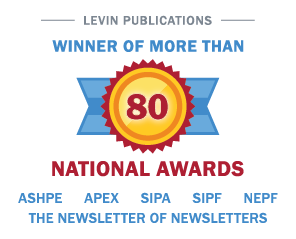 Go to http://www.levinassociates.com/landing/har20order or call 800-248-1668 to order today.